A bottle a day keeps the earth going round another day. By bottle, I mean recycling bottles. A great way to get into the recycling routine is to involve all of your family members. The process of recycling is beneficial not only for Earth, but recycling also lets you educate your children about the ecosystem, making them, interested at a fairly young age, so they can carry on through their adult life with a green conscience. 1. Get them excited about recycling. Here is a great video to get you started, where they explain everything you need to know: Recycling with Family. 2. Get them educated on the environment and why recycling is good for the planet. Help them grow a conscience by explaining them what at terrible problem we have when it comes to the disposal of trash. There are many books that talk about the subject. Explain to them how every time we cut a tree, we must replace that loss by planting a new one. 3. Buy Eco-friendly garbage containers. The more colorful they are, the better. That way you catch a child’s eye when looking for the recycling bins, making them seem like toys. You can have a blue one for bottles, a red one for glass to signify it as a “be careful” bin, and a green one for paper. You can also get creative with the bins. 4. Personalize bins with paper, bottle caps, etc. It will make everyone feel a bit more inclined to fill their bin up. You can assign different chores. If you have 3 kids, this shall come as an easy task. Assign a color per child, and have them be responsible for taking that one out, or collecting all the materials that belong to that bin. In my house, my daughter Sarah is in charge of the plastic bins, so she’s always asking “mom, have you finished with your drink? Can I throw away the bottle?”. She sees it as a game, so in my head, all you can hear is “mission accomplished”. 5. Come up with fun incentives. Some of the family members at first will not be accustomed to recycling. This goes for adults and children. A nice game is to have a chart by the recycling area. 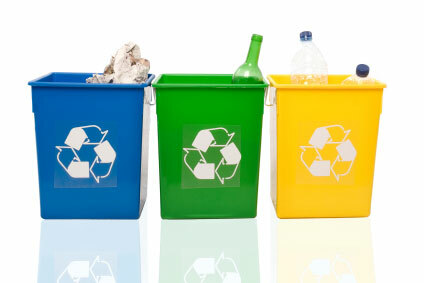 Make a list of every recyclable item you normally recycle. Put the family member’s name. For every item they recycle, they must mark it on the board. Whoever has the most points at the end of the week gets a special prize. If this seems like too much of a hassle, you can simply explain to them why the main incentive is to help the earth. It depends on every child, since not every one of them will respond the same way. 6. Getting your family into a routine is great. Teaching them how to recycle will help improve their outlook on prolonging Earth. I have a lot of family members who leave paper, bottles, and newspapers lying around the house. Teach them about when all the trash inside the bins will be taken out and show them what the process looks like on Youtube videos or take them on a field trip to show them what recycling is all about. 7. Reuse. Reuse. Reuse. Using jars that once contained jam or peanut butter are a great way to store craft items. Clean them and reuse them. There are a lot of plastic containers that could be used and reused. Shampoo bottles can be bought once, and then you simply buy the eco friendly version which is just the refill. Think before you recycle. If it can be re-purposed then re-purpose it. Old clothes can either be donated or you can use them to make puppets, plush toys, and quilts. Make recycling with your family an important pastime with them so they can someday teach this to their own kids.